Wedding cakes do not have to be large and full of decoration. You could go for something subtle, stylish and chic like this cake. 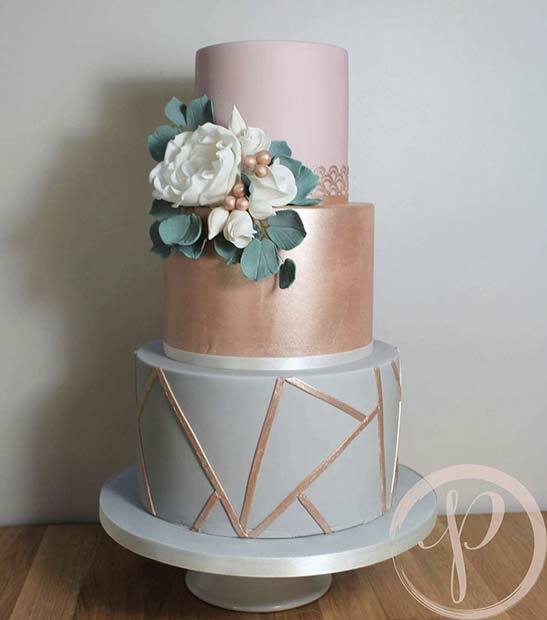 This cake has two tiers, the first has a diamond pattern with two rose gold stripes and the top cake is rose gold. The cake is then finished off with flowers. A cake like this will suit any wedding theme. If statement cakes are more your thing then this could be the cake for you. 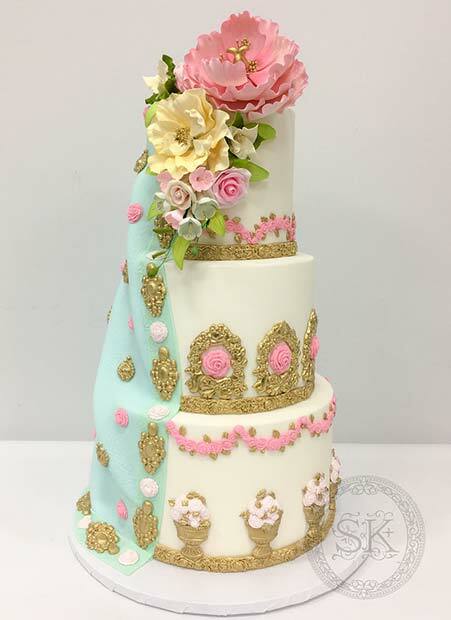 This cake has three tiers and each one is decorated with flowers, gold patterns and more. A cake like this will wow and make a great centerpiece for the table at the reception. You could get something like this recreated in different colors. 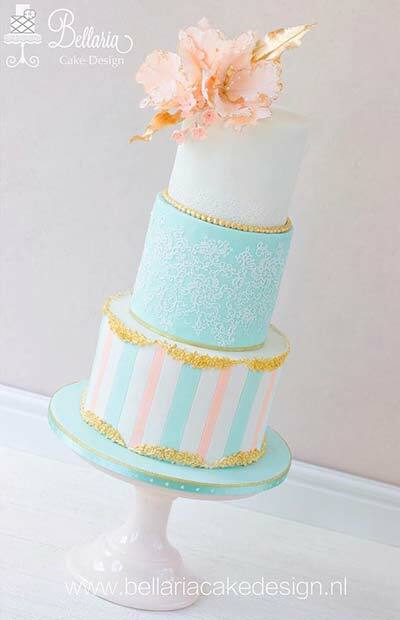 Our next cake features the classic three white tiers but this one has had a spring update. 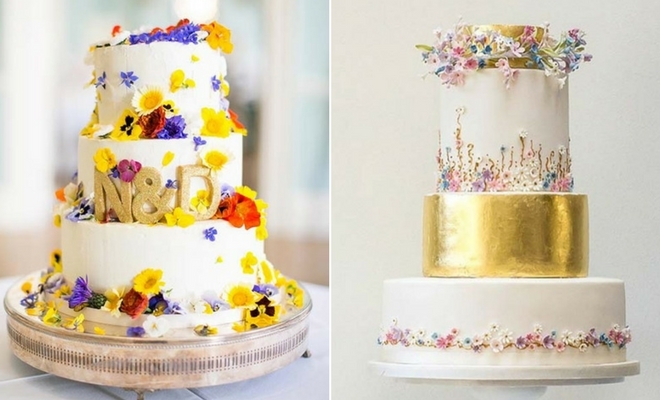 The tiers have all been decorated with vibrant sugar flowers. A cake like this is perfect for any spring wedding. You could have this recreated with any flowers in any colors. 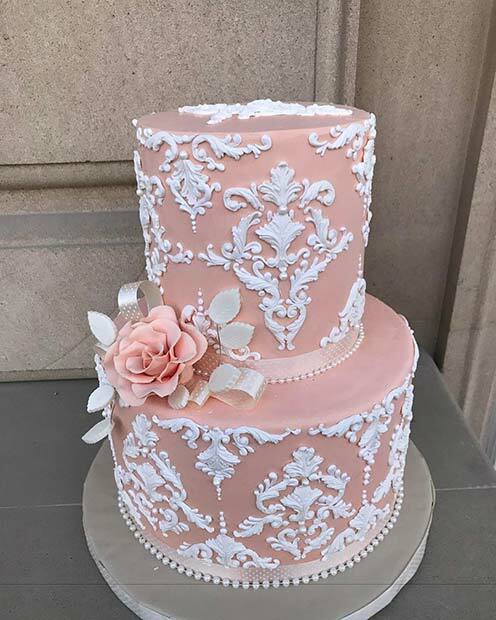 Next, we have this gorgeous pink cake. We love this cake as the soft pink is perfect for spring and captures the romantic vibe of a wedding. The pink cake also has a beautiful white pattern and flowers. 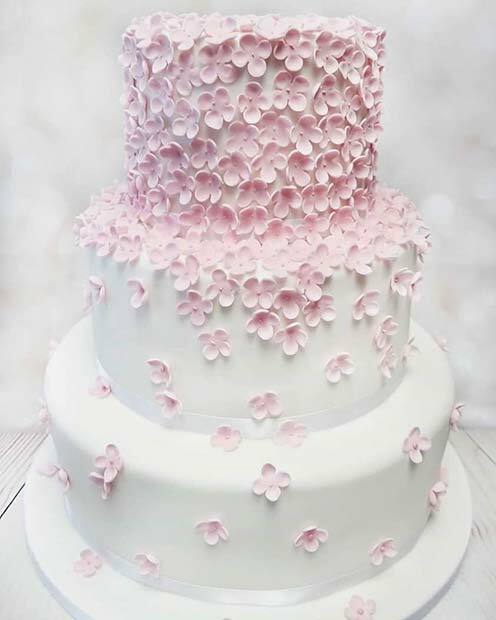 Pink is the perfect color for a spring wedding cake. Looking for a show stopping cake that will wow? Then this cake could be for you. The cake has three large tiers and is full of flowers, pearls and more. A cake like this is amazing and looks too good to eat. Not only that but a cake like this will look fantastic on the wedding photos. Your cake does not need lots of tiers. You could have a single cake like this one. The small but stunning cake has beautiful pink icing and is decorated with lovely flowers. It is a petite cake, but it is gorgeous and is perfect for a spring wedding. If you are looking for a unique and vibrant cake, then this next one could be for you. This cake is blue, pink and white. It has been decorated with stripes, patterns and flowers. A cake like this would look beautiful at any wedding. You could also use the blue without the pink and white. Our next cake is perfect for a trendy couple. The bottom layer has a funky geometric pattern, the second layer is rose gold and the top layer is a soft pink. You could recreate a cake with three similar layers or use on of the designs for the whole cake. Earlier in the post we mentioned a geode cake. This is another example of the geode cake but in a different style. 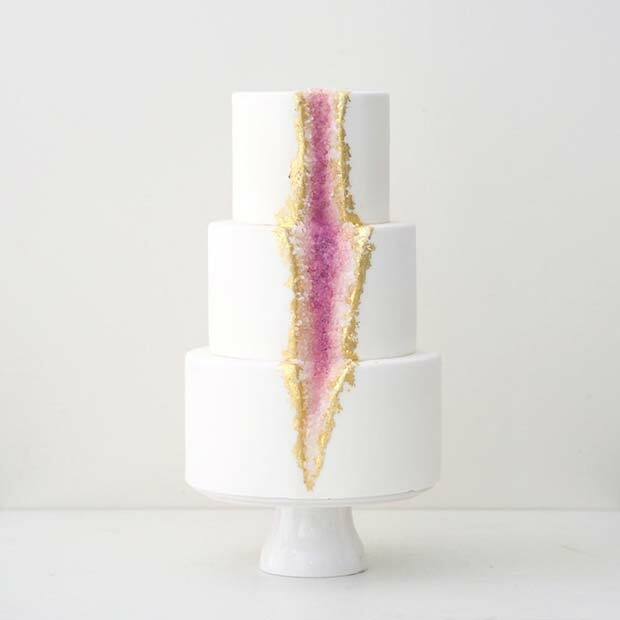 The cake has the classic three white layers with a pink and gold geode. As the geode is pink it gives the cake a pretty look. 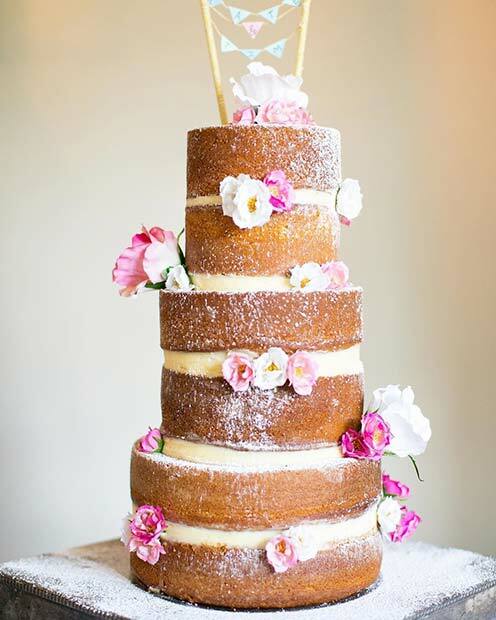 A cake like this would be beautiful for a spring boho wedding. Next, we have the ultimate spring cake. Each tier on the cake has been hand painted with a different scene. 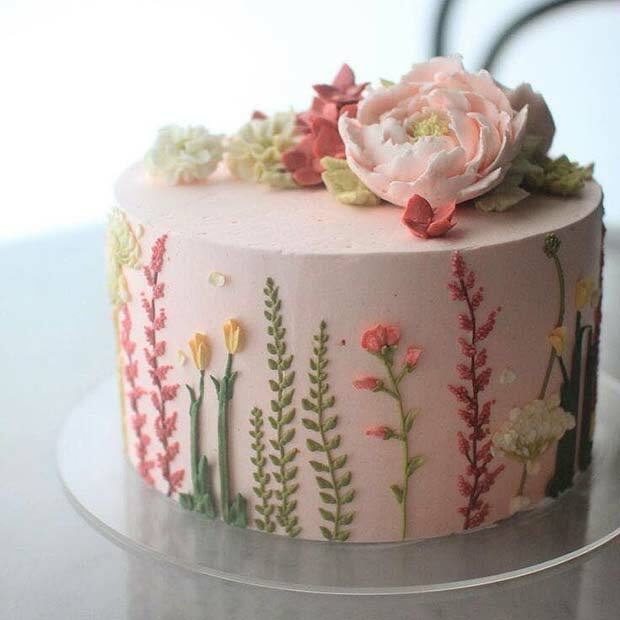 Everything about spring is on this cake from the green trees to flowers to the sunshine. 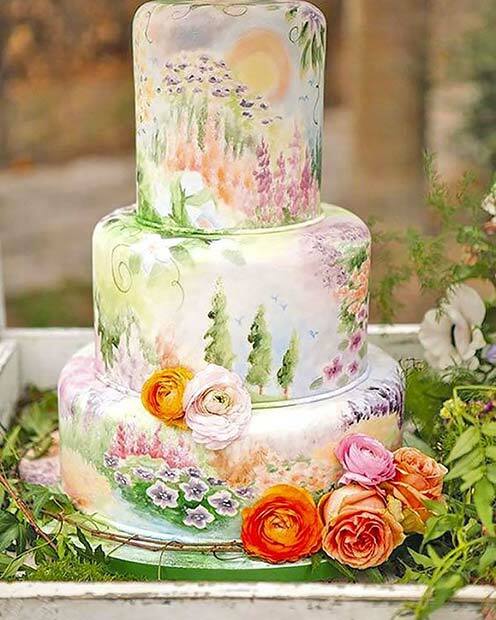 This cake is perfect for nature lovers and couples who love the spring. If you are looking for a pretty and romantic cake, then this one could be for you. 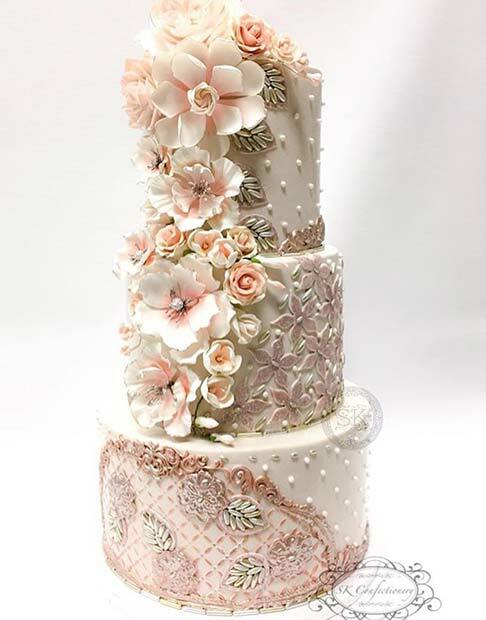 This white cake has been decorated with small pink sugar flowers. 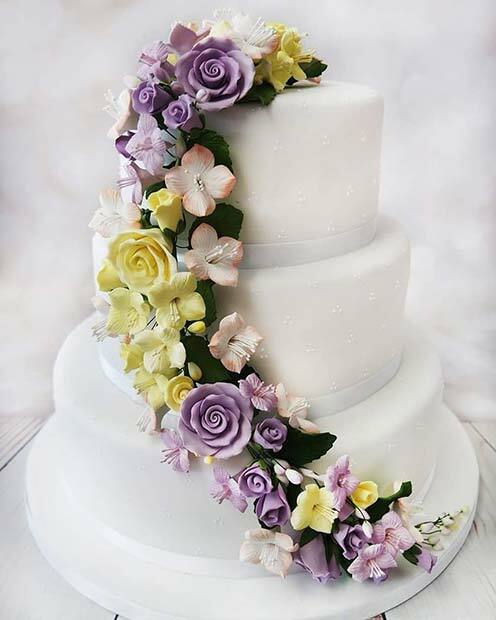 We love the flowers on this cake because they cover the top tier and gradually start to spread out. You could have a cake like this with different flowers in a different color. Don’t like a lot of icing, then this cake could be what you are looking for. The large cake is not iced, and it is just a beautiful sponge. With an un-iced cake, you can also see the delicious filling inside. You could have a cake like this and even add in the flowers. You could decorate the cake with flowers of your choice. 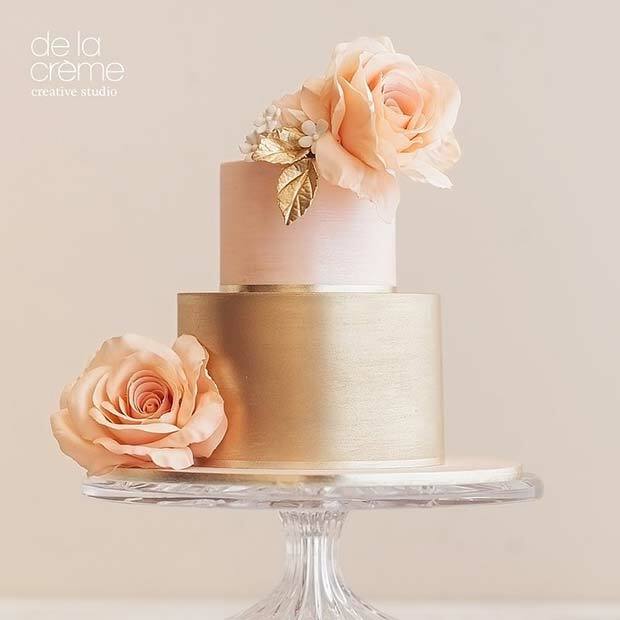 Last on our list is this beautiful pink and gold cake. 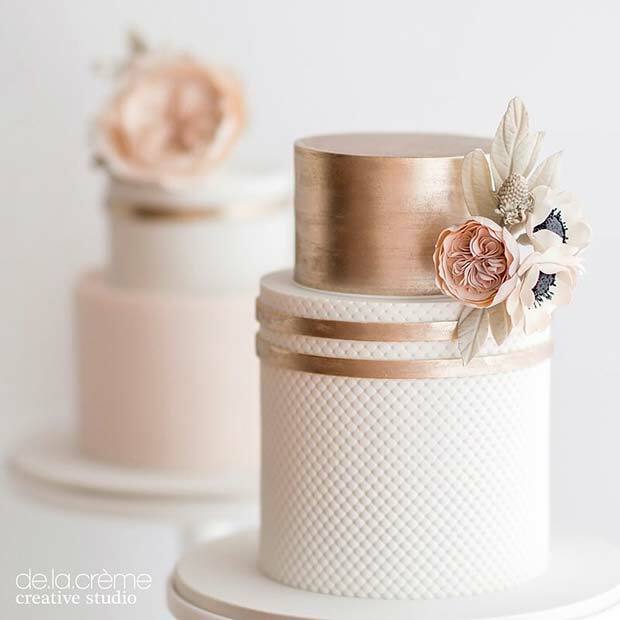 This two tier cake features a gold layer on the bottom and a soft pink cake on the top. The cake has also been decorated with flowers. A cake like this will suit any wedding. You could even add some tiers. We hope you have found the perfect cake for your wedding!